At least 14 people have been killed and several others wounded in a gun attack near a military camp at the Kenyan border with Somalia. It is believed the victims were workers from a local quarry in Mandera county in the north-east of the country. Residents told the BBC they had heard two explosions, followed by heavy gunfire in the middle of a night. Militia group al-Shabab, which operates out of Somalia, has confirmed to the BBC it carried out the attack. Mandera County Commissioner Alex Ole Nkoyo told AFP that people were sleeping when the gunmen struck. "They just came and hurled explosives in the houses," he said. 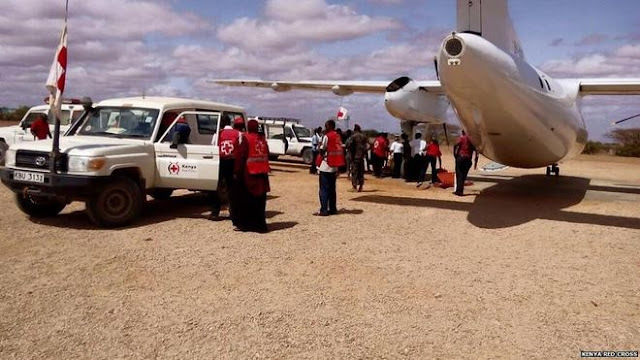 Kenya Red Cross said it was sending an aircraft to the scene to fly the injured to hospitals in Nairobi. An al-Shabab source told BBC's Mary Harper the group was behind the attack. In December 2014 al-Shabab killed 36 quarry workers in Mandera town. On that occasion they attacked while the workers were sleeping and shot the non-Muslims dead after separating them from Muslims. Their deadliest assault to date happened at a university in the Kenyan town of Garissa in April, when four gunmen killed 148 people. In 2013, at least 67 people died in a gun attack on the Westgate mall in the capital Nairobi.